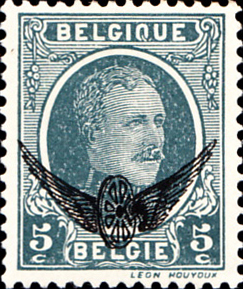 Belgium passed the necessary legislation for postal reform in 1847, a year before France, but was slow to implement the service. See note. There was a long history of postal services in Germany, thanks largely to the efforts of Thurn and Taxis which administered Bavaria's post until 1808. 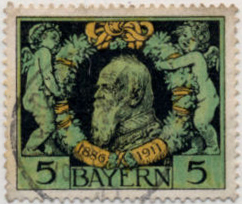 On 1st November 1849 Bavaria was the first of the many German States to issue stamps, the others following in the 1850s. 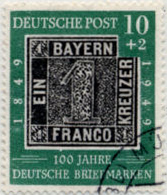 This is another expensive first issue (£550, SG1 Sc1), but the 1 kreuzer black was fortunately featured on the third stamp (and the first charity stamp) issued by the newly-formed German Federal Republic in 1949. The 1862 first post due label is also outside my price range (1862 SG-D34, Sc-J1 at £120). It is unlikely ever to be commemorated. Prince Regent Luitpold was commemorated twice in 1911, for his 90th birthday (on March 12th) and the 25th anniversary of his regency (issued 10th June). 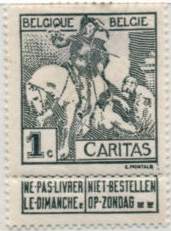 Both are shown above as the second is one of the most attractive stamps of the period. He died in 1912. 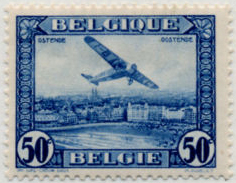 Neither Gibbons nor Scott list a Bavarian airmail, but there is a Michel listing for a 1912 stamp from the Bayerische Aeroklub. If generally recognised, this would be the first ever airmail, beating Italy's by five years. Definitive overprints were issued from 1888 for use by railway officials and perfins from 1912, so the 1916 issue shown is the first real official stamp. This was the first display, written in 2008. 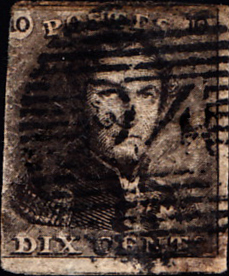 In the 2013 rewrite additional features have been added, such as showing many of the miniature sheets commemorating first issues on the back of pages. The example from Belgium overleaf is the messiest MS found so far, with an example from Uruguay a moderately distant second. The Belgium #1 was updated in Feb15. For years on the old and new versions of these pages I was showing the wrong stamp. Thanks to Crispin Howell-Jones for pointing this out.